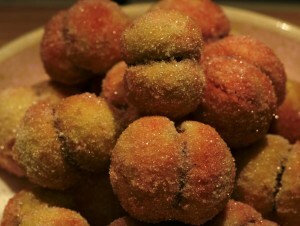 The name of these delicious little cakes literally means “little peaches”, and it is not hard to see why! However, they do not actually contain any peach in the ingredients. They are very popular across many parts of Croatia, Bosnia and Herzegovina, Serbia and Motenegro, though it is not known exactly where they originated in the former Yugoslavia. No special occasion, such as a wedding or birthday celebration, would be complete without breskvice being served. They are also a winter favourite, particularly around the New Year. 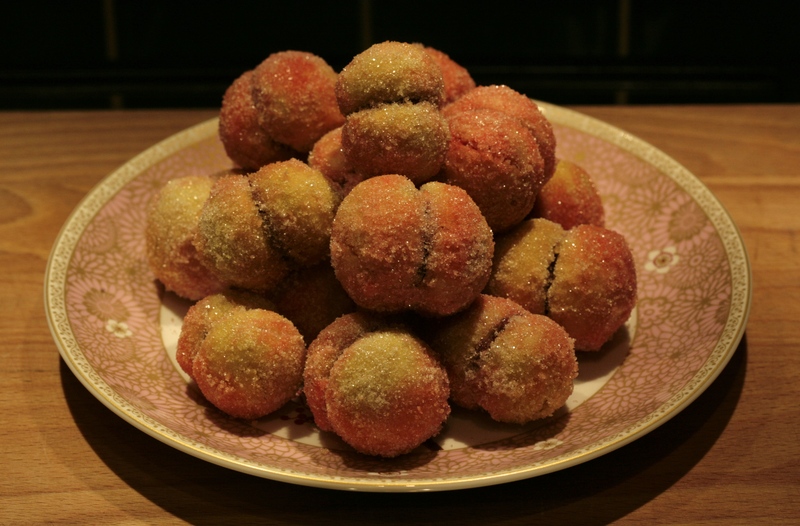 This is one of my favourite ever desserts and I have extremely fond memories of gorging myself on them as a child. Zdenka, a dear close friend of my grandmother, used to make these for me when I lived in my home city of Mostar. After I moved to England in 1999, Zdenka would make a full tub of them and my grandmother would give them to me. Her breskvice were the best I have ever tasted, and they were always gone within days! Zdenka sadly lost her battle to cancer in May 2010, but just one month before she died my grandmother took down her recipe and I present it to you here. Breskvice take time to make and some of the steps are quite fiddly, but the end result is well worth it and is sure to impress any crowd. Note: These are the quantities provided in the original recipe. However, this makes quite a lot-if you’re making these for just your own family as opposed for a party, I suggest you scale down to 3 eggs (or even 2) and adjusting the rest of the ingredients accordingly. 1) Beat eggs with the sugar. Add 100g of the flour along with all the other ingredients and mix thoroughly, stirring in one direction. Leave to stand for two hours. 2) Add the remaining flour gradually and in small batches, stirring in the same direction every time. Keep going until you end up with a smooth, soft dough that is not sticky to the touch (you may need to add more flour to achieve this as exact amount will depend on factors such as the size of the eggs you used and the humidity on the day e.g. humid weather usually means more flour has to be added). 3) Cut off ¼ of the dough and, working on a lightly floured surface, roll it into a long sausage shape about 2.5cm thick. Cut the sausage into two and set the other to one side if it gets too long. Take a sharp knife and cut it into 1 to 1.5cm pieces. The pieces must be uniform in size. Note: the size of the final product will depend on how thickly you cut the dough. 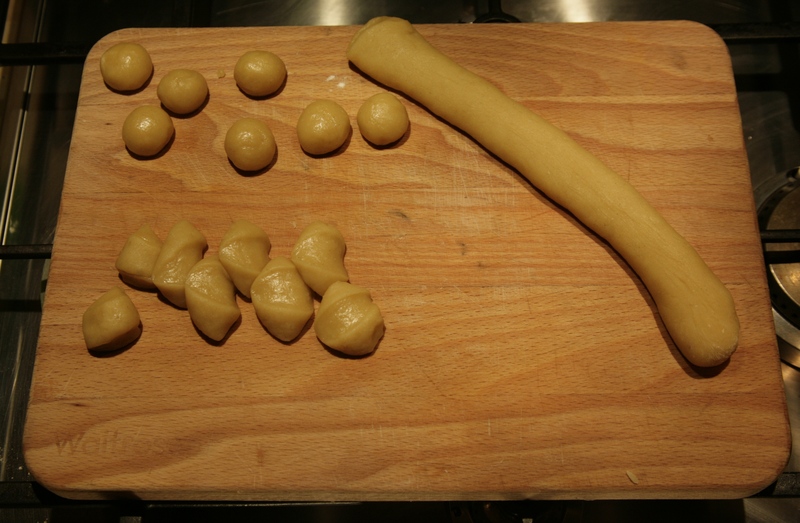 The dough in various stages of preparation. 4) Prepare a large baking tray by covering it in parchment baking paper or lightly oiling it. Pick up one of the dough pieces and roll it between the palms of your hands into an even, smooth ball. There must NOT be any cracks, and the ball must be as perfectly spherical as possible. Place it on the baking tray and repeat with all the remaining pieces of the dough, leaving a 2cm gap between them. 5) Preheat the oven to 200 C/180 C fan. Bake for about 20 minutes or until the dough balls are baked through and golden or are just starting to turn brown (they should not be golden brown). Take out and leave to cool completely (you may need to use more than one tray or bake them in batches). 6) Take one baked dough ball in your hand and turn it over to the flat bottom. Using a small, sharp knife, carefully make a series of cuts all around the edges and gently push it outwards to make an indentation. Scrape out more of the indentation to enlarge it, reserving all the crumbs in a bowl. Be careful not to go all the way through or use too much force or you will risk shattering it into pieces. Repeat with all the remaining baked dough balls. 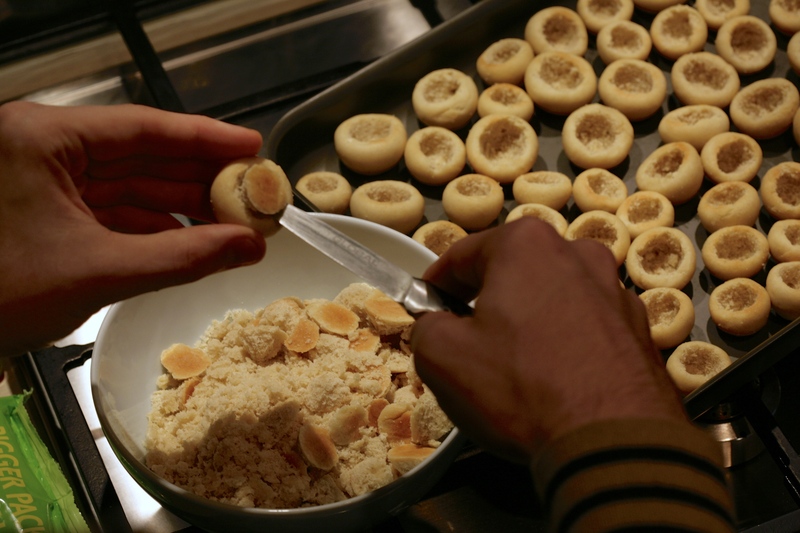 Carefully hollow the individually baked dough balls, making the cavities as large as possible, and reserve all the crumbs in a bowl. Note the colour-they should NOT be darker than this. 7) Make the filling. Combine the reserved crumbs with the jam, walnuts and rum (if using). Taste it and add more sugar if it’s not sweet enough. Note: you may vary the proportion of the filling ingredients as you wish, adding more or less of anything to your taste. 8) Using a teaspoon, fill two of the hollowed out halves with the filling. Carefully press them together (the jam will hold them in place) and you have one completed breskvica! Repeat with all the other halves. 9) Take a small bowl and dissolve natural red food colouring (I find cochineal red works well) in a little water; do the same with the yellow food colouring in a separate bowl. Fill another bowl with plenty of sugar. One by one, dip each breskvica into one of the food colouring bowls and cover half of it in the colour, then immediately dip it in the other bowl, colouring the other half. Roll the still wet breskvica in the sugar, making sure the entire surface is coated. Repeat with all the other breskvice, leave them to dry for about an hour and they are ready to eat! However, they will taste even better the next day. Enjoy! They will keep at room temperature for 10 days.